Ramblings from a casual web surfer. The CRTC released its annual Communications Monitoring Report last week and, as usual, the document shows Canada to have a very healthy – and wealthy – telecom and broadcast industry. Revenues and subscribers are up pretty much across the board and everyone is happy. Among the more notable items in the report are some claims – and omissions – made about broadband internet services. Given the overly glossy presentation of some of the findings it sure looks like the CRTC is guilty of some serious PR spin, which is somewhat alarming because it’s not something a supposedly neutral regulator should be doing. If you’re currently drinking something, now is the time to spit it out all over the screen. Only in the halcyon world of the CRTC, where the sky is purple and pigs can fly, could that claim possibly be true. Looking at the actual report, it’s clear how the regulator came to its ridiculous conclusion: only eight select countries – Canada, the United States, Japan, United Kingdom, France, Germany, Italy and Australia – were compared (page 192). When the full numbers from Akamai, whose statistics the regulator’s claim is based on, are factored in Canada actually places ninth in average speed among OECD countries (South Korea, Japan, Denmark, Belgium, Switzerland, Czech Republic, Ireland and the Netherlands are all ahead). Add in a few non-OECD emerging broadband powerhouses, such as Latvia and Romania – both of whom rate better than Canada – and the CRTC’s claim gets even more absurd. The same goes for other studies that include non-OECD countries. Ookla, for example, rates Canada 33rd in download speeds, or only slightly above the global average. At the very least, the CRTC is guilty of the same selective grading and broadband bikini-ing as Cisco in its recent internet usage report. What does the CRTC report say about upload speeds? Not much – and that’s probably for the best. That same Ookla report ranks Canada 65th in upload speeds, behind the likes of Rwanda and Kazakhstan. Seriously. That’s no exaggeration. Here’s a speed test I just did on my Rogers connection: a very respectable 18 megabits per second download, with a ridiculous 500 kilobits upload. Amazingly, here’s another test I did on Mobilicity cellphone, where the upload was 1 Mbps, or double that of the Rogers cable connection. It’s probably not necessary to get into the importance of good upload speeds. While fast downloads allow for good media consumption, upload speeds are integral for creation and therefore innovation. 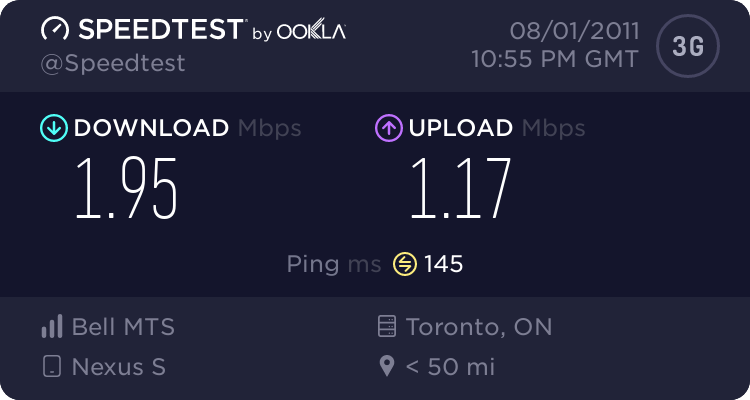 The bottom line is Canada can’t even try to aspire to an innovation-based economy without first making sure it has proper upload speeds. This hasn’t occurred yet to the CRTC, which is obviously too busy peddling its Kool-Aid vision of a country with wonderful broadband. via CRTC is peddling broadband Kool-Aid « WordsByNowak. on August 2, 2011 by Brad.